Disco Fever in stores today! 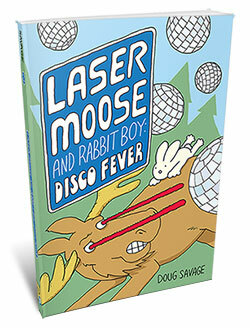 Laser Moose and Rabbit Boy: Disco Fever is in stores today! It’s the sequel to last year’s Laser Moose and Rabbit Boy, and this time it’s one big story – featuring a new villain, Evil Chickadee, and the return of Laser Moose’s nemesis, Cyborgupine the cyborg porcupine. For more information and links to online booksellers, see the book’s website. Can’t wait for you all to see what I’ve been working on for the past year. And when you do see it, I’d love to hear what you think! Please let me know, or maybe even write a review on Amazon or Goodreads or your favorite bookseller website! 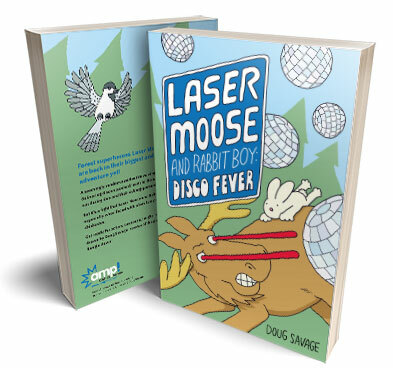 Here’s a teaser trailer for Laser Moose and Rabbit Boy: Disco Fever, the second book in the Laser Moose and Rabbit Boy series! The new book is 144 pages, full-color, and it’s coming out on October 24. I can’t wait for everybody to see it! For more details, check out the Laser Moose and Rabbit Boy website. And you can read samples of the book on Amazon and on my publisher’s website. Thanks to everybody who entered this year’s Halloween contest! 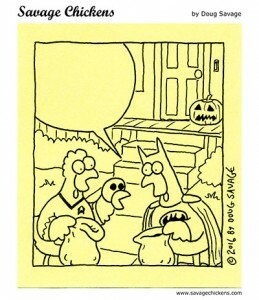 Lots of great suggestions this year, including lots of fun Star Trek and Batman jokes, with many dead Robins and redshirts. Congratulations to the winners! I’ll be in touch soon to get your address information. Thanks to everybody who participated!